Summer is in full swing with long, hot days and cookouts with family and friends. There’s nothing like topping off an afternoon of grilling out with a dessert that’s both sweet and tart! 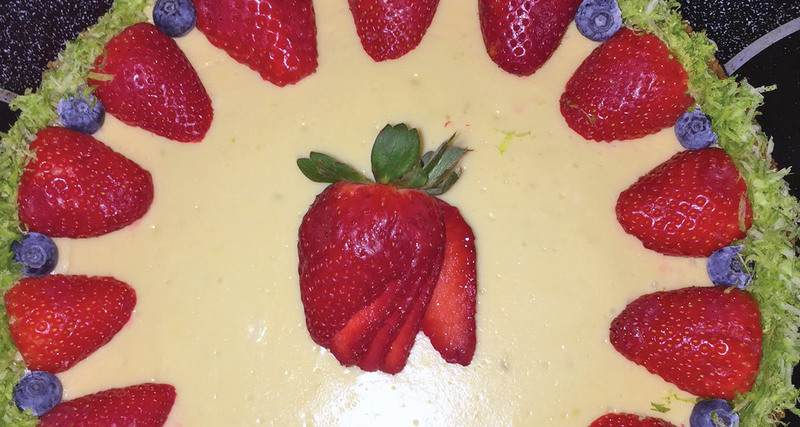 The perfect dessert for any summertime gathering is Key Lime Cheesecake…it’s one delicious summertime treat! Stir together first three ingredients and firmly press onto the bottom and 1 inch up the sides of a greased 9-inch springform pan. Beat cream cheese at medium speed with an electric mixer until fluffy; gradually add 1¼ cups of sugar, beating till blended. Add eggs, one at a time, beating well after each addition. Stir in sour cream, rind and juice. Pour batter into cooled crust. In a medium saucepan, combine sliced strawberries, sugar and 1 Tbsp. lemon juice. Place over medium heat and bring to a boil, reduce heat, stirring to prevent from burning. Strawberries will release juice without any mashing required. Reduce heat to low-medium and simmer 20-30 minutes or until the sauce has thickened, continuing to stir occasionally. Remove from heat and cool to room temperature. Keep in mind sauce will thicken up slightly as it cools and even more with refrigeration. Cook all ingredients over medium heat, stirring constantly, so the sauce cooks but doesn’t stick. Once the jam turns into a liquid, remove from heat and cool, then refrigerate. Drizzle over slices of cheesecake when served.